Ever since returning from China last month Roy has been hard at work finishing up his forthcoming book, Great Teas of China. In this excerpt he discusses traditional jasmine tea. Expected publication date is Q4 of this year. If you'd like to be notified when the book is available, send us an email. 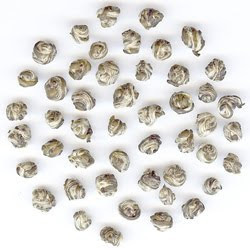 If you love fine jasmine tea or have yet to discover this great tea of China, try our Imperial Jasmine Pearls. Producing fine jasmine tea starts by selecting the best green tea in early spring. Tender leaf buds from Fujian’s Fuding area are considered the best base material for great jasmines. This green tea features nice white tips with good amounts of down that absorb aromatics well; also, the tippy green tea from Fuding is less astringent and well suited for scenting. The spring-harvested leaves are withered indoors, pan-fired to stop oxidation, then rolled into shape and roasted dry. This type of green tea is called hong qing (“roasted green”). The finished tea is cleaned and sorted into different grades and carefully stored until the jasmine blooms in early summer. When the jasmine harvest begins, unopened flower buds are picked early in the morning and delivered to tea factories in late afternoon (modern factories sometimes buy jasmine blossoms in open wholesale markets). The flowers are laid on the ground to allow them to open naturally. Their high moisture content causes fermentation and heat, which forces the buds open. The piles of flowers are watched carefully to avoid over-fermenting. The flowers are turned and flipped in the air to release moisture and prevent too much heat from accumulating, which would cause the loss of aromatics and “burning” (the flower turning brown). This process generally lasts until very late at night. Finally, when most of the flowers are open, they are machine-sifted to remove unopened buds. At the same time, the spring-harvested tea is taken from storage and re-roasted to remove staleness and ensure that it’s completely dry and ready to absorb the jasmine fragrance. The flowers are then mixed with freshly fired green tea in small batches. Each batch is watched carefully and turned from time to time to release heat. This process continues through the night, allowing the tea to slowly absorb the nectar and essence of the flowers. The tea and the flowers are separated in the morning. The tea is roasted dry once again to remove the excess moisture received from the flowers and further eliminate some of the leaves’ own astringency. This scenting procedure may be repeated as many as seven times, each time completing a cycle of fluid exchange from the flower to the leaf, ensuring the complete saturation of floral aromatics. 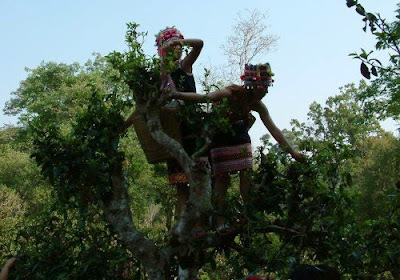 When the scenting is completed a final step called ti hua (“floral pickup”) is done. Ti hua includes a light roasting to reduce moisture to under 5 percent, and the tea is again mixed with freshly opened flowers for a few hours. Ti hua saturates the leaf with floral aromatics externally, to heighten the aromatic appeal. The entire process must be done so that the color of the leaf remains green without losing the white color of the fuzzy tips. Jasmine teas are often hand-fashioned into various shapes to add visual interest. One of the most popular is called jasmine pearl, or sometimes jasmine dragon phoenix pearl. These small, tightly rolled balls are created in the spring, when the tea is fresh. They’re produced by selecting only spring-harvested single tips (no open leaves). The tips are softened by pan firing, then a few are hand-rolled into a “pearl” shape, held together by the leaves’ juices. The pearls are carefully stored until summer, when jasmine blooms and they can be scented. Sometimes teamakers use long rolls of cotton paper to hand-wrap each individual pearl. They’re eventually unwrapped before scenting. Have you ever longed for a time machine that could fill your teacup with the amazing teas of yesteryear, grown back before pollution, global warming, and "efficient" agricultural practices starting chipping away at the quality of even the best tea? Roy is always fondly recalling the high quality of the teas he used to acquire back when he first opened Imperial Tea Court. So imagine his delight when he stumbled on stashes of two 1993 teas from Anhui--a qimen mao feng and the green tea huo qing (jade fire). Even more exciting: when we tasted these teas it turns out they've actually improved with age! Among the latest tea fads in China is a taste for aged black tea, and that led Roy to prowl around the warehouse, looking for specimens that might interest his Chinese customers. That's when he stumbled on small, long-forgotten containers of the Anhui teas. As Roy says, "tea just doesn't grow like this any more." In fact, once common huo qing is rarely seen these days. The dark, tightly rolled huo qing leaves with furry tips that Roy unearthed have a hard, shiny lacquered appearance, the elusive bao guang ("treasured luster") that occurs when plump leaves full of nutrients and flavor ooze out their juice during processing; the juice coats the dried leaves and hardens into a glossy shell. Roy explained that certain teas age well if they have enough nutrients in the leaf and are maintained in a mild, dry climate like we have here in the Bay Area. The remarkable teas of Yunnan are so rich in nutrients that they improve even under the extreme conditions of an accelerated shou process. For the Anhui tea, especially the green huo qing, a bit more luck was involved. After inspecting the dry leaves we infused them in 195-degree water. As Roy noted, a green tea this old needs hotter water than when it was fresh, to help it rehydrate and bring out all the dimensions of flavor and aroma that have long been dormant. We immediately noticed that the leaves stayed on the bottoms of both gaiwans, instead of floating to the top, and the submerged leaves were quickly surrounded by a small puddle of color. Roy said both of those were positive signs that the leaves of the two teas are heavy with nutrients. At last it was time to taste. All those years in storage have deliciously concentrated flavors and added new dimensions. Roy raved about the qimen. "It's heaven! I never thought I'd taste qimen like this again," he exclaimed. "It's totally sweet, smooth, and non-aggressive, with none of the green harshness you find in today's qimen." The red-orange liquor was thick and juicy, totally lacking smoky or astringent notes, and it brewed up bright and clear. Meanwhile, the huo qing was rich, sweet, and complex, with a satisfying thick texture. It was vaguely reminiscent of Yunnan green tea, but without Yunnan's pronounced fruitiness. The liquor was a clear golden color. Even after 16 years, the infused leaves were still green. The good news is that, although quantities are very limited, there's enough of these very special teas to share with customers. While supplies last, you can find them in our online store. Upon infusion in hot water the leaves quickly opened up and began coloring the water. The qimen produced a rich red-orange brew, while the huo qing had a golden liquor. The infused leaves of the two teas. Roy brought his personal puerh teapot into the teahouse today, so we took the opportunity to spirit it away for a brief photo session. Few objects are more personal than one's favorite teapot. Among a diverse collection of pots, a few get elevated to favorite status by virtue of an exceptionally tactile affinity between pot and owner, in addition to aesthetics and the way the pot suits your personal brewing style and preferred tea varieties. Then, because it's your favorite, it's the pot you use to brew the best tea, so it just gets better and better, and even more uniquely adapted to the owner. Roy's pot was made by the well regarded teapot artist Zhou Xiao Qin in a design inspired by the famous Wu Jing teapot, the oldest known intact pot made with Yi Xing's zi sha (purple sand) clay. A few years of intensively brewing fine aged puerh have given it a glossy surface and an emerging brown patina, although the pot was originally more of a gray-brown color. Every tea lover has a favorite pot or two. Share yours in our Virtual Teahouse on Facebook, where you can upload photos for the entire group to see. We look forward to having a look at your best teapots! We've had a lot of positive feedback on Roy's "OMG" Tea Class earlier this month. Amy Lawrence of the Afternoon to Remember teahouse and web site wrote, "Last night teas were just OMG! They all were so unique. I can't even tell you which one was my favorite because I loved them all. One of my favorites, though, in appearance was the Imperial Tribute Harvest Purple-Tip Puerh. I was fascinated by the leaves and their color. Thanks so much for doing the class last night and sharing your favorites. I am so inspired!" Chef Karen Diggs told us, "Thank you again so much the fantastic OMG class on Sunday. I feel truly fortunate to be permeated with your rich experience and art of tea! Tasting such rare treasures really delights the senses and fills the heart!" Tea is a practice in Asia, what they call a Way. And in every Way--whether martial arts or gardening--you acknowledge and honor your lineage, which is to say your teachers and their teachers. You can say I know this is what the Buddha taught because my teacher Suzuki Roshi revealed it to me. You see, a teacher does not just tell you something, she or he opens your eyes to something and makes sure you SEE what they speak of. And like Buddhism in any of its sects, tea is also a Way and has its lineages also. And here you are tonight entering the same Way of Tea I myself entered almost twenty years ago and with the same teacher, our esteemed Roy Fong, so it seems not amiss I say a few things about our lineage. I feel all the more entitled to speak being Roy's senior student, since Roy has been my teacher in tea since just before he opened San Francisco's Imperial Tea Court in 1993. I must have been one of the first to whom he ever demonstrated the use of the gaiwan or taught to pronounce "long jing," so you can imagine how long ago it was that these now commonplace understandings first came to San Francisco. Imperial Tea Court was the first traditional Chinese tea house in North America and one of my proudest honors is that Roy made me the Tea Court's Honorary Director. What he really did was annoint me the Apostle of China Tea and I have rejoiced in my function ever since. Roy has taken me home with him, literally and figuratively, to China, the homeland of tea, and revealed some of her treasures and my life has simply never been the same. I am one of a small but not insignificant number who can now claim to have received this tea transmission from Roy. We should be respectful of where it came from--not just our own teacher, I mean, but where he got it. We also are heirs to Roy's lineage, which is the most ancient tea lineage of all. Starting around 2,000 years ago tea was adopted and popularized all over China by immigrant Buddhists, but its origins are more ancient still. Tea is a cultural accomplishment the Chinese developed along with their deep understandings of yin/yang, tai chi, feng shui, i ching, acupuncture, and herbal medicine. These and other aspects of the Way, or dao, China's sages pursued for forty generations or more after rice cultivation was already well established in China six thousand years ago. Today we would call those ancient hermits and herbalists under whose influence tea slowly evolved from food to medicine to tonic to beverage Daoists and for them tea originally must have been both a science project and a magico-religious practice. We should always remember that Roy Fong is a Daoist priest in the fullest sense. This is where he's coming from and what he brings to us. Time is the only difference between teacher and student. With time and attention we students can gradually come to know as much and understand as deeply as our teacher does. This is not a question of accumulating mere facts however. Information is not knowledge and knowledge itself is not understanding. Of course a teacher gives invaluable information, but mainly a teacher gives us a way of approaching, of looking at, or experiencing things. Roy can direct your attention to the concert of taste occurring on your tongue as you sip and you will discover sensations you could not otherwise have noticed. The experience itself cannot be taught. What Roy gives us is vision--both the procedures of tasting and the understandings of how the leaf itself was transformed. Then tea experience comes upon us the way it can on nobody else who has not been led to the light by such a teacher. Drinking tea with such a one is always a revelation. We just sent out our latest newsletter, which features Wu Yi yan cha, two zhu ni teapots, two amazing vintage teas (not puerh) from 1993 that Roy found in the warehouse, special Values of the Month, and more! Have a look and be sure to subscribe so you don't miss a single issue. Ever since returning from China last month Roy has been hard at work finishing up his forthcoming book, Great Teas of China. Here's an excerpt in which he shares the unlikely beginning of his life in tea. Expected publication date is Q4 of this year. If you'd like to be notified when the book is available, send us an email. I didn’t recognize the significance at the time, but my destiny with tea began in childhood, in Hong Kong. I had a boring forty-five-minute walk to school and often detoured past a group of day laborers waiting to be hired. They passed the time by making gong fu cha on a makeshift table, and when curiosity got the better of me I’d squat alongside them to watch the ritual that offered one of the day’s scarce pleasures. Occasionally they would offer me a cup of what, to a six-year-old, smelled and tasted like the most wonderful tea on earth. I’ll never forget those memories, and I am sure this experience is the seed that blossomed into my passion for tea. After emigrating to the US and spending my teenage years in San Francisco, I dropped out of college and started working as an auto mechanic and tow truck driver. After a few years, I planned a month-long vacation back to Hong Kong. One day I happened to wander through the Sheung Wan district, where old teashops were still in abundance. There was an irresistible aroma, the smell of fresh tea being roasted over charcoal. I was drawn into a teashop and, without realizing it was a life-changing decision, decided to learn more about tea! I spent the rest of the month going to every single teashop I could find. There was no tea too expensive or too unique to try at least once. In those days tea was purchased with virtually no instructions; buyers were expected to know what they wanted. In Hong Kong tea is almost a fact of life. Everyone drinks it, often with little conscious thought or care given to the details. For me, that month in Hong Kong was spent in nine heavens. I visited and chatted with teashop owners, made friends, and learned trade secrets such as re-firing tea prior to sale, a practice that would later inspire me to fire my own Monkey-Picked Tie Guan Yin. I bought so much tea that I discarded all my belongings in order to fit more tea into my luggage. Back in San Francisco, I returned to my towing business and continued to buy tea from my new tea friends in Hong Kong. These relationships proved very important when I finally started to sell tea for a living. At that time, I regarded myself as a serious tea drinker but nothing more. I never imagined that tea would one day be my vocation. Mr. Luo soon sent a full container load of puerh tea. My wife Grace and I started selling to Chinese restaurant distributors and my new career as a tea merchant was underway. Some of the inventory from this original shipment formed the nucleus of my precious puerh collection. When the concept of our first Imperial Tea Court was being developed in 1991, I called on my tea friends in Hong Kong to support me with their best products. This they did with very favorable terms and I am still grateful for their support. After we opened, however, I found that the standard practice of going to a tea broker to purchase available stock didn’t allow any input from me, and I decided that in order to procure the best tea possible, I would have to understand each phase of tea production better. As my tea knowledge grew, I developed a practice that I continue even now: I target a tea that I am interested in and travel to the region where it grows. Instead of going right up to the farms, I spend time learning about local customs, food, and climate. Knowing what the people of the region eat and drink, understanding soil and weather conditions, and participating in the harvest and production all yield a deeper understanding of what gives a tea its unique character, and how to produce and prepare it in a way that best fulfills its potential. Roy Fong's OMG Tea Class: It Really Was That Good! It was a full house last night at the Ferry Building for Roy's eagerly awaited "OMG" Tea Class, where he brewed and discussed five extraordinary teas from his personal collection. Tea lovers from around the Bay Area and as far away as Texas joined us, as did "tea celebrity" James Norwood Pratt. It was a great group of a dozen folks who are passionate about tea and eager to taste some teas they've never had before. The evening started with the loose-leaf version of our Imperial Tribute Harvest Purple-Tip Puerh. Although this tea was picked just two years ago, it comes from a grove of ancient tea trees, hundreds of years old, in a remote forest in Yunnan. The leaves tell the story of how different this tea is. It consists of leaf buds that are large and resemble bamboo shoots. Instead of the usual green, they're so full of flavor and nutrients that they're actually a reddish-purple color. We use a photo of the cake form of this tea in the logo for this blog! We've written extensively about this incredible tea and its rich, fruity flavor without a hint of the bitterness you usually find in recently picked Yunnan teas. Every time we drink it the flavor gets sweeter and more concentrated, similar to the way grapes slowly turn into raisins. It was a fittingly "OMG" introduction to the class! Next it was time for everyone to get hands-on. We passed out gaiwans that contained a small pinch of Imperial Lotus Heart Dragon Well; the assignment was to add additional leaf to taste and try brewing this king of all the early spring green teas. Then Roy demonstrated his preferred technique--not for everyday brewing. Load up the gaiwan with double the amount of leaves you'd usually use and brew in barely lukewarm water. When he shared his tea it had an amazing, thick viscosity; unusual sweetness; and just a hint of astringency to balance the flavor and show that the tea wasn't underbrewed. Then we opened the freezer for a novelty from Taiwan: su dong cha, or "frozen tea." This tea is flash-frozen moments after processing is complete; in fact, freezing replaces the final stage of drying the leaves, which is usually accomplished with heat that drives off some aromatics. Frozen tea uncannily preserves the florals in Taiwan green oolong; as Roy put it, it's "like drinking flowers." Normally only tea farmers in Taiwan get to enjoy this treat, but Roy air-shipped a small quantity for the class. Finally, we concluded the evening with a side-by-side comparison of two 1989 puerh cakes Roy bought in Yunnan 20 years ago. They've been aging in his warehouse ever since. The interesting thing is that although the cakes started out identical, different storage conditions have left one cake green, with little oxidation and no fermentation, while the other has fermented into the classic shou, or dark aged, state. Both cakes yielded rich, fruity infusions and the bright, clear liquor that's a mark of quality. However, the green cake's liquor was golden amber, while the shou cake yielded a ruby red brew with even thicker viscosity. You could still taste smokiness in the green cake from the leaves' original drying process; the shou tea has a sweet, fresh earthiness balancing the fruit. In all, the two cakes provided a great lesson in how fine puerh evolves over time, and what a big difference storage conditions make in the outcome. We live-tweeted the class from Twitter and, as it turned out, so did one of the attendees! If you missed the class but would like to learn more, here's a copy of the handout. Some photos from the class; more details coming soon. On Wednesday Roy and I previewed some of tea he's considering for his "OMG" Tea Class September 13. We drank Roy's luscious special preparation of lian rui long jing (lotus heart dragon well), the first cup of his personally hand-fired 2009 Monkey-Picked Tie Guan Yin, and then set to the puerh. Roy brought out three old cakes that he bought directly from the Yunnan Tea Import & Export Corp. in the 1980s. An alarming number of "old" puerh bing cha on the market today are simply moldy fakes, complete with vintage paper wrappers. By contrast, all of Roy's old puerh he either bought directly from Yunnan tea factories or acquired from Yunnan tea officials years before puerh caught the attention of global tea markets. Ever since, it's been aging in our Oakland warehouse, carefully tended to prevent excessive dryness or mold. Oakland isn't nearly as humid as China, so puerh ages more slowly and gently. Differences in aging were really apparent in the first two teas we tasted, two 1989 cakes from Xishuangbanna. In those days, puerh wasn't segregated by mountains. Factories blended together tea from from several locations; if anyone tells you otherwise, your fraud detection antennae should go up. These two cakes started life together from the same harvest at the same factory, but the aging process went differently. One stayed drier and has aged gradually, while the other received a bit more moisture that stimulated more bacterial action. Originally sheng cha, both cakes have become shou cha through the natural bacterial and enzymatic processes that are unique to puerh. Both cakes appeared dark, but a first moistening of the leaves began to bring out their differences. One had a startlingly intense dried fruit aroma, with a pronounced smokiness, but no earthiness at all. The other was quite earthy, with a strong fruit undertone. Roy brewed modest quantities of leaves of each tea for only a minute or two, in a gaiwan, with near-boiling water. In the cup both teas had the beautifully bright, clear liquor (ming liang tang se) that signifies top quality aged puerh. However, the first yielded a rich amber infusion, while the second was bright ruby red, reflecting its much higher level of oxidation. The infused leaves told a similar story. For the first tea, the leaves were still a muted olive green and at a glance could pass for lightly oxidized oolong leaves. Meanwhile the damp leaves of the second tea--where the outer layers of the cake, in particular, were more affected by bacterial and enzymatic changes--displayed a 50/50 mix of dark green and dark brown. On the palate, both teas exhibited the extraordinary, almost candy-like sweetness of fine aged puerh. For the first one, the fruitiness nearly bowls you over and even after all these years, there's a distinct smoky note. For the second the earthiness is potent yet not overwhelming, balanced by a concentrated fruit flavor more pronounced than it is in the nose. Both teas have rich mouth-feel and a shockingly clean, sweet aftertaste that you're reluctant to disrupt by eating or drinking anything else. Roy observed that the first tea could be successfully aged for many more decades in the right conditions; the second could age more as well, but perhaps not quite as long. Each tea was a living chronicle of its life so far; Roy likens puerh to "living beings." The young green tea, the smoke that tells the story of a damp day during harvest, the slow maturation of fresh fruitiness into intensely sweet, almost raisinated preserved fruit notes...to drink each tea is to consume its full life history. These teas are an extraordinary experience; a number of people have even reported that they evoke strong emotional feelings, even tears. We'll leave it to you to judge for yourself, but even Roy let an involuntary "oh my god!" slip out. We didn't call the class that for nothing! We'd already drunk enough fine tea to qualify as a day in tea heaven, but Roy decided to gild the lily with one more even older puerh, a cake from the early 1980s. In addition to being the oldest tea we drank, it had experienced the most beneficent microbial action. Due to storage conditions, the surface even exhibited a few traces of white mold whose growth had been arrested early. If the mold begins to grow, it can easily ruin the cake by consuming or transforming too much of the tea's vital essence. It was no surprise that this old tea had the earthiest nose of the three, and the infused leaves were dark and crumbly. The infusion was an astonishly rich, viscous red--beautifully ming liang tang se. Again, the dominant impression was terrific sweetness, potent, concentrated fruit, and a pleasing, clean earthiness. I'd planned to take more notes and photos, but to be honest, the tea was so fantastic that I could think of nothing else. Roy's "OMG" Tea Class is from 6-8 PM Sunday, September 13, in our San Francisco Ferry Building teahouse. It's not too late to join us. The tea will be amazing...and don't be surprised if you end up exclaiming "oh my god!" at least once! 2009 Monkey-Picked Tie Guan Yin and Imperial Tribute Harvest Purple Tip Puerh lined up for a taste test prior to Roy's OMG Tea Class this coming Sunday in San Francisco. Congratulations to Karen in Sunnyvale, who was selected in our random drawing of people who ordered from our online store between August 19 and September 4. Karen won a great prize, free tuition for Roy's upcoming "OMG" Tea Class on September 13. Karen, we look forward to seeing you in class! The "OMG" Tea Class is going to be something really special, an evening of tasting, brewing, and discussion with Roy about five of the rarest and most exotic teas in his personal collection. The class is from 6:00-8:00 PM in our San Francisco Ferry Building teahouse. If you'd like to attend it's not too late, there are still a few seats left! We hope you can join us for this unforgettable tea evening of a lifetime for tea lovers. We just out the latest email newsletter, featuring Yi Xing teapots and oolong tea, along with our September Values of the Month, two fine organic green teas. Many products and special offers are promoted exclusively in the newsletter, so if you're not already on the mailing list be sure to subscribe so you don't miss a single issue! Jin Mao Hou ("golden-haired monkey") is an unusual tea from Wu Yi Shan that's like a "greatest hits" oolong hybrid: tie guan yin plants have been grafted to yan cha root stock in an experiment aiming to recreate the more weighty type of tie guan yin of yesteryear. Moderately fired, it yields a golden amber infusion with more vicosity and more pronounced florals than a typical yan cha, but more depth than most of today's tie guan yin. The leaves are smaller than your average yan cha and still mostly green, not too oxidized or high-fired. This well balanced tea is a fascinating brew that will appeal to everyone who loves oolong. We only have a very small quantity, so we're making it available in 8-gram sampler packs that make 1-2 gaiwans or teapots, depending on the size of the vessel. Gui Fei Cha ("concubine tea") hails from Taiwan and is produced by a unique method: it’s briefly attacked by insects, tea green leaf hoppers. The plant's natural defense to the invasion changes the flavor of the leaf and unexpectedly yields a distinctive floral—almost honey-like—aroma and taste to the tea. You'll notice that Gui Fei Cha is made with a smaller leaf set than most oolongs, and includes downy white tips that add visual interest to the tightly rolled greenish leaves, as well as pleasing weightiness in the mouth. The dry leaves have a sweet, fresh aroma, but when they're moistened the powerful, enticing honey tone really comes forward. In the cup this well oxidized but moderately fired tea has a rich golden amber color and, again, the signature sweet honey smell. It's not too late to enter the drawing for a free seat at Roy's "OMG" Tea Class on September 13. This very special event in our San Francisco Ferry Building teahouse from 6:00-8:00 PM will feature five of the rarest, most exotic teas in Imperial Tea Court Teamaster Roy Fong's personal collection. You'll taste and discuss them with Roy and then have a chance to brew at least one of the teas with Roy coaching your technique. The class is filling up, but we've reserved a seat for the winner of the drawing. Every time you make a purchase in our online store through midnight (PDT) September 4 you're entered in the drawing. The winner will be selected Saturday, September 5, and announced here on the blog. We look forward to seeing you in class on the 13th!